Bumble Bee Arrow Frogs are small frogs with black and yellow bands, hence their name. The bumblebee poison dart frog (Dendrobates leucomelas) is a species of poison dart frog. It is endemic to Venezuela. Formerly common, its habitat is now in decline and the species is diminishing. D. leucomelas is the most toxic of its genus, the second-most toxic being D. azureus. Dendrobates leucomelas was formerly common. It was most frequently seen in Venezuela, but it also had populations in Brazil, Guyana, and Colombia. Recently, however, due to habitat loss and the fungal infection chytridiomycosis, the populations of the bumblebee poison dart frog have diminished and today the species is only found in Venezuela. This species relative ability to withstand broad variations in humidity and temperature, combined with its comparatively bold nature, make it a popular choice for those enthusiasts and amateur herpetologists involved in the exotic pet community. It is widely seen as being an ideal starter species for amateur hepetologists wishing to keep poison dart frogs for the first time. The species' ability to be easily bred in captivity has led to a fall in prices within the exotic pet trade, which is an alleviative factor to the problem of over harvesting. Once in captivity and removed from their natural source of food, Dendrobatidae lose much of their toxicity. Dendrobates leucomelas, however, are not one of the three main Dendrobatidae species that are used for poison darts by native South American tribal hunters, so toxicity levels are somewhat lower in wild caught specimens than in the Phyllobates genus. The bumblebee poison dart frog is diurnal and highly active. Seemingly constantly energetic, bumblebee poison dart frogs are intelligent and curious amphibians with a frequently seen desire to explore changes to their surroundings. In captivity they are among the boldest of the poison dart frogs, making little or no attempt to conceal themselves. Bumblebee poison dart frogs live in groups of four or five in the wild; captive specimens can be kept in smaller or larger groups. Like D. tinctorius, groups of leucomelas set up established territories and defend them against rival groups. This can result in squabbles involving frogs "pairing off" with frogs from the opposing group, and wrestling. Use spagnum moss with our Poison Arrow Frogs. This absorbs water that is sprayed into the terrarium without turning mouldy. Poison Arrow Frogs like places to hide during the day. Wooden Branches and artificial plants should be used to create a forest habitat with foliage to hide in. Artificial backgrounds can be used to create a more natural effect. Poison Arrow Frogs are very delicate frogs. Most problems do occur when they have been handled. If you do need to move them make sure your hands are wet. Arrow frogs as a group have evolved bright, flashy colors to warn potential predators of their foul taste and toxic skin secretions. In fact, some species of arrow frogs have skin toxins that are deadly. The good news is that captive bred arrow frogs, as well as those that have been in captivity for a while, lose all traces of these toxins. In nature, they eat a particular ant species, and from the amino acids within these ants they synthesize said toxins. So luckily, crickets and fruit flies make for a mostly harmless pet. That said, these frogs should still not be viewed as a handling pet. For one, they are frogs, which in general do not tolerate the stress of handling nor the trauma to their fragile skin. Secondly, even though they are not deadly, there is a chance of a mild reaction to their skin secretions should it be ingested or make contact with a mucous membrane. During the breeding season, large assemblies of colonies gather in order to reproduce. Males let out a pleasant warbling or whistling call to attract mates. Females grapple with each other over the calling males, and the victor approaches the male in question and willingly allows him to court her. The male attempts to stimulate the female by stroking her head, flank, and cloacal area; after a few minutes of this, the female occasionally begins doing the same to the male; this is fairly rare in the wild, but quite common in captivity. The male leads the female to a place he has selected for ovipositioning, usually within a shallow puddle on the forest floor. If she approves of his choice, the female will lay a clutch of 5-10 medium-sized eggs. One or both parents will remain on guard, gently cleaning the eggs and moistening them with their urine. The eggs hatch after approximately two weeks, climbing onto their parents' backs and sticking to them via specialized mucus. The adults then carry their tadpoles to water-filled hollows at the base of trees and deposit them in the centre. The adults remain on guard; the tadpoles feed on mosquito larvae and other small food items that inhabit their nurseries. Adult bumble bees will measure between 1.5 to 2 inches in snout to vent length. Males are typically smaller, with a slighter, more angular build, while females are larger and more robust. 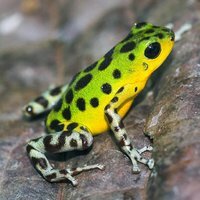 With recent advancements in our understanding of arrow frog husbandry and natural history, bumble bee arrow frogs can be expected to live over 10 years in captivity. Longer life spans are not out of the question, especially as our knowledge base continues to grow.